Different Rules for Byrnes Mill? A check of the Jefferson County assessor’s website reveals that Byrnes Mill mayor Susan Gibson, who is up for re-election, paid her personal property tax (PPT) bill on January 22 of this year (click to enlarge). Byrnes Mill mayor Susan Gibson’s personal property tax account for 2012. January 15 was the filing deadline for candidates for the April 2 election. Therefore, Gibson was in arrears on her PPT at the deadline. Shaun Missey of Arnold, JR Graham of Pevely, and Ron Woehrle of the North Jefferson County Ambulance District (NJCAD) were removed from their respective ballots for this offense. But Gibson is still on the ballot. It needs to be noted that the same city attorney, Bob Sweeney, serves Arnold, Byrnes Mill, and the NJCAD. So why the different treatment for Gibson? As I have noted previously, Sweeney’s opinion in 2011 was that the law requiring candidates to be current on their property taxes did not apply to municipalities or special districts. In 2011, two of his cronies (Crisler and Moritz) ran for Arnold City Council while in arrears, and were not removed from the ballot. Sweeney apparently changed his mind this year, when Missey and Woehrle just coincidentally don’t share his views on governance. It is my not-a-lawyer opinion that he was correct in 2011, and thus wrong this time around. Now, January 22 was the day that ballot submissions were due from these various entities to Wes Wagner, the county clerk. I wonder if Sweeney et. al will claim, if this discrepancy ever piques the interest of the media, that she paid her bill before close of business on the 22nd, therefore she was allowed to stay on the ballot. If that is their argument, then I think it will be safe to assume that a little bird told Gibson to get thee to the collector’s office by 5 pm. In the letter Arnold City Clerk Diane Waller sent to Missey, dated January 18, she said “you are not eligible to be a candidate.” That doesn’t seem to leave any possibility of a post-January 15 reprieve. Missey stated on Facebook that she told him the same thing, January 15 is a drop-dead deadline. Sweeney might also claim that it was the Byrnes Mill clerk’s failure that kept Gibson on the ballot. He claimed in the January 31 Leader that he “had nothing to do with the investigation [to check Arnold candidates’ eligibility].” He could also say he had nothing to do with the Byrnes Mill clerk’s lack of investigation. I think these were and will be lies. Sweeney instructed Waller in the 2011 memo that it was not her duty to investigate candidates’ tax status. I highly, highly doubt she would adopt a whole new modus operandi without consulting Sweeney. I also doubt she would take a bathroom break without consulting Sweeney, but that’s another story. If anyone cares to pursue this, I think this could be the smoking gun that blows up this whole racket. Of course, the 2011 memo should serve the same purpose. 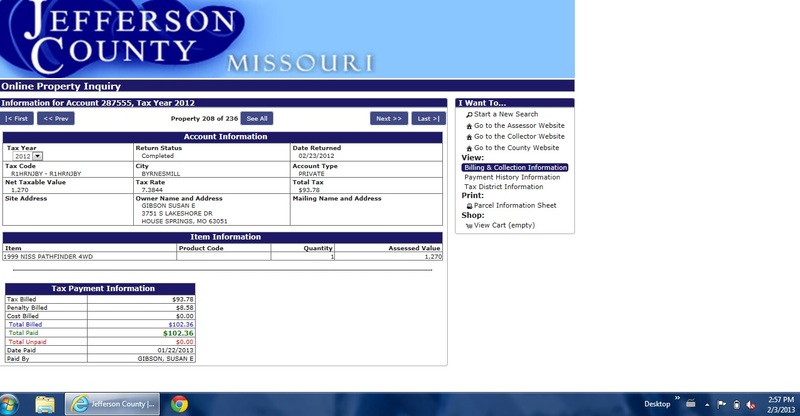 Note: On February 1, Gibson’s taxes were listed as unpaid on the county website. I talked to someone at the collector’s office that afternoon, and the official there told me that Gibson’s payment was posted January 22, and that the website was not up to date (for her and for other accounts). They must have updated this record after they talked to me, as it is now current. Perhaps it is simple to update the website when you have the record open in front of you.